COLUMBUS, Ind. - Toyota Material Handling, U.S.A., Inc. (TMHU), the supplier of the number one selling lift truck in North America, celebrated the end of its 2012 philanthropic giving year with the donation of two internal combustion lift trucks to the Columbus, Ind. Community. During a ceremony attended by local business leaders, TMHU President Jeff Rufener presented one ceremonial forklift key to Columbus Mayor Kristen Brown and another to United Way of Bartholomew CountyPresident Mark Stewart. Toyota forklifts are manufactured at Toyota Industrial Equipment Mfg., Inc. (TIEM) in Columbus, Ind. "Supporting the City of Columbus and United Way of Bartholomew County was a natural decision for Toyota," said Jeff Rufener, president of TMHU. "Both organizations provide vital services to Columbus residents. We are honored Toyota's locally-made lift trucks will be put to good use in our community." The City of Columbus will use its lift truck at the City Garage, the distribution center for a variety of city services, to help load and unload supplies and equipment. "We are grateful to Toyota Material Handling, U.S.A. for this generous donation," said Mayor Brown. "This is a well-needed piece of equipment for daily operations at our City Garage. 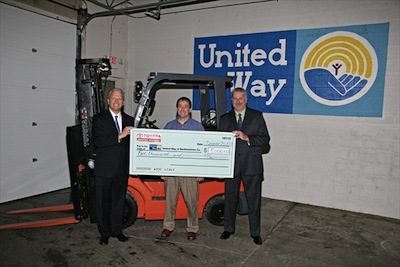 We had budgeted $35,000 to buy a new forklift next year, and this donation will provide a great savings to taxpayers. Toyota is a great community partner." United Way of Bartholomew County will use its Toyota forklift to transport and handle donations at its Doug Otto Center in Columbus. The center houses and supports numerous not for profit agencies and programs. "We are very grateful for Toyota's generosity. The donation of this forklift will benefit the 39 nonprofits and 47 programs in the Doug Otto Center," said Stewart of the United Way of Bartholomew County. "In the event of another disaster, the forklift will help process the tremendous volume of donations that are typically received. Having a new forklift will make such a difference." In addition, TMHU Vice President of Aftermarket Sales Terry Rains selected this same United Way for an additional $5,000 donation from TMHU. The monies will be used to support the organization's many programs, which include early childhood education, programs for individuals with disabilities and self-sufficiency programs for those below the poverty level.